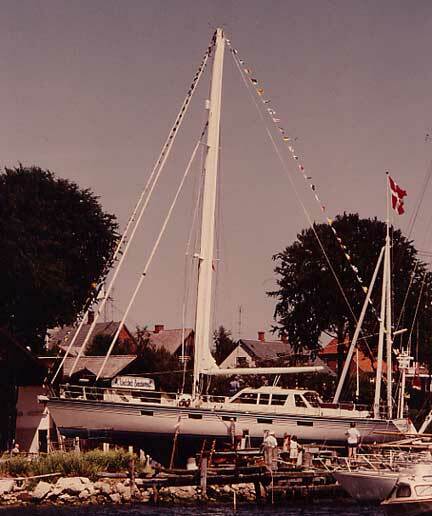 The process started in 1978 with the first Deerfoot, 68 feet LOA with a beam of 14.5 feet. She featured the first swim platform, fore-and-aft watertight bulkheads, and an aft engine room. Over 35 years later, she is still cruising as efficiently as ever. 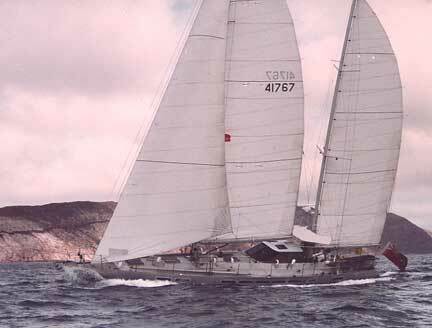 Wakaroa, a 72-foot ketch, followed the next year. She was built for a couple who had previously circumnavigated. Wakaroa was owned by our original clients until 2010, who sailed her countless miles and raised their two sons aboard in the ensuing years. She has one of the most beautifully executed interiors you will ever see – created by the same crew, under the direction of Kelly Archer, who eventually built the FPB 83 prototype Wind Horse for us. 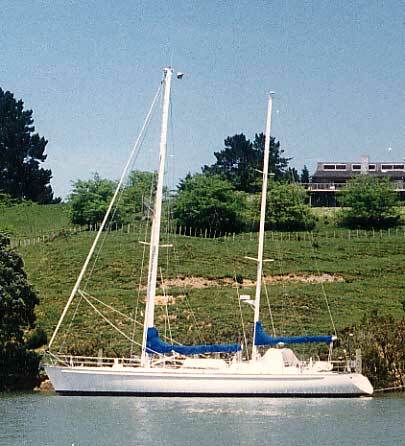 Wakaroa was the first of our builds to have the owner’s suite forward. All subsequent designs incorporated this layout. 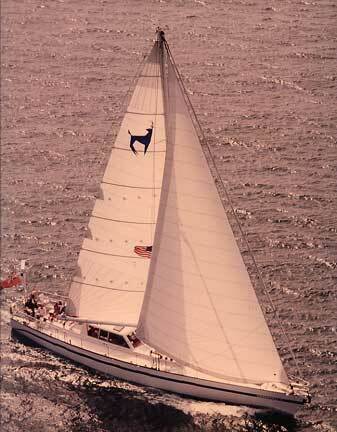 Intermezzo ll, at 62-feet LOA, represented our ideal family cruiser when she went into the water in 1980. She incorporated everything we’d learned during our circumnavigation. She was our mobile home for 20,000 very comfortable sea miles. As with our previous builds, Intermezzo II had watertight bulkheads, an aft engine room, and highly efficient systems, which allowed her to to enjoy life on the hook with minimal charging time. She proved to be a benchmark design in our approach to heavy weather – after learning some significant lessons in a fall storm off Cape Hatteras (see our book Surviving the Storm for more details on this blow). She also showed us how much fun it was to cruise at 200+ miles per day! 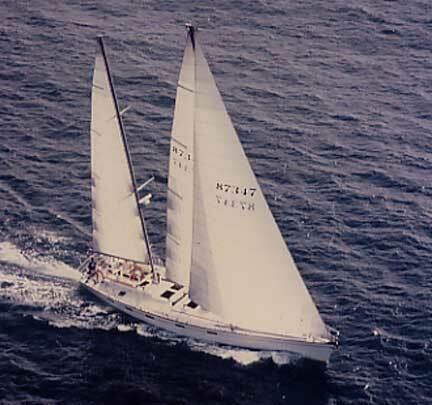 The 72-foot ketch Locura came along in 1982, and was the only one of our designs on which we did not directly oversee the construction. Her hull shape was optimized for reaching and running. She’s done at least one circumnavigation (and maybe more by now) and has proven herself to be a very quick cruising boat. 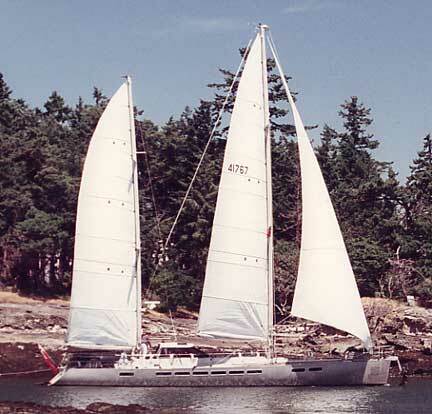 Then came a series of 72-foot pilot house cutters, starting with Deerfoot II (above), launched in 1983 and under the command of her original owner until 2013. 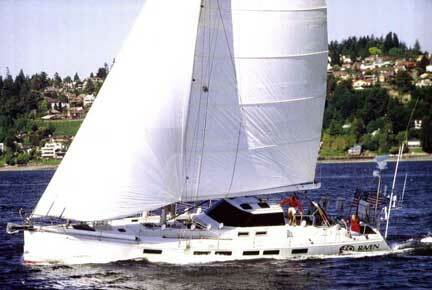 While these vessels are very efficient sailboats, they also have excellent capabilities under power. They’ll do a steady nine knots straight uphill under engine in the most unpleasant conditions. Of course they are much quicker once they begin to sail, but for those upwind destinations, it is sometimes nice to light off the iron genoa while relaxing in the pilot house. Interlude came next. She has done at least two circumnavigations and is still cruising. 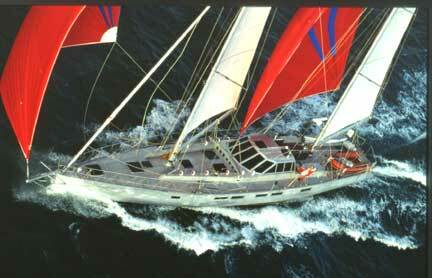 She was followed by Maya, a 74-foot ketch of similar concept. 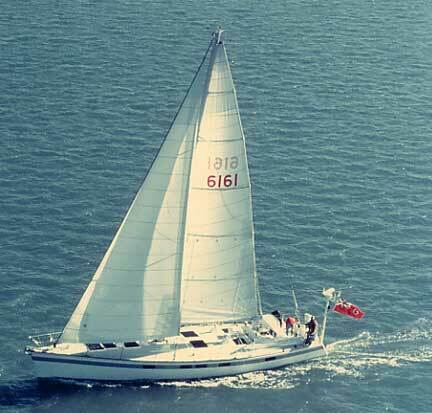 During the same period in the mid-1980s, when we were building the previously mentioned pilot house cutters and ketches, we also did a series of 62-footers (to which we refer as the 2-62s). The first of these, Moonshadow, is shown above, on her way to a transatlantic elapsed time record in one of the early ARC races. Moonshadow is still cruising. Although our boats are designed strictly for cruising, optimized for getting their crews across the ocean comfortably and safely, there is no rule that says you have to be slow. In fact, the ability to maintain a good turn of speed on an average basis is a big safety factor in dealing with weather (and avoiding storms). 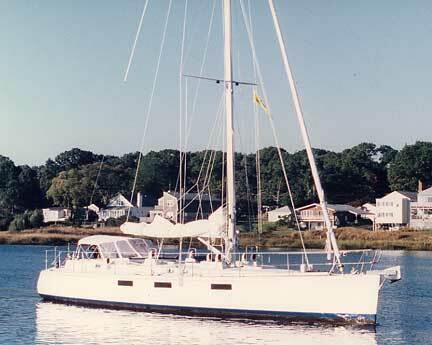 The 58-foot Terra Nova was also launched during the mid-1980s. Here she is during sea trials on the Baltic. That week onboard, during the Scandinavian “summer”, was about as cold as we’ve ever been! The last of the Deerfoot Series were these 61-footers. They were extremely easy to sail, and very, very quick. Faster, in fact, than some of the larger boats that went before. The first of these boats, Hotspur, made the passage from New Zealand to Panama (direct) at an average speed of 200 miles a day. There are numerous trips around the world accounted for by the Deerfoot 61s. In the “Deerfoot Story” (part of which can be seen on our Dashew Offshore YouTube channel), you will see quite a bit of footage taken aboard the Deerfoot series designs we’ve just covered. All of the preceding designs had certain hydrostatic properties in common. The hull lines incorporated moderate beam for an efficient shape and good steering control under autopilot in heavy weather. Draft was moderate. But for some time we’d been thinking about a new approach to what was going on under the water – a different way of distributing hull volume that we thought would be faster and more comfortable. The 67-foot Sundeer was the result of this noodling. 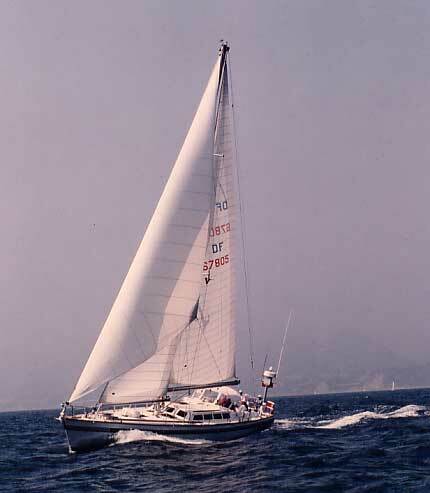 She was quicker under sail than our larger Deerfoot designs. Sundeer typically averaged 230 miles per day in the trades (and rarely less than 200 at other times), yet gave us the same level of comfort as the larger designs when offshore. Sundeer was another of our corporate test beds. We put over 20,000 miles on her in a few years of cruising, much of which you can enjoy by watching the videos on our YouTube channel. Between the South Pacific and Alaska she took very good care of us. She’s since cruised back and forth across the Atlantic, spent time in the Med, and currently resides mainly in the Caribbean. 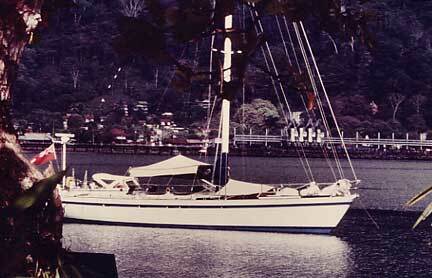 The success of the Sundeer prototype led to us to do the Sundeer Series of production yachts. These 65-footers took what we learned with the Sundeer 67 prototype and refined it. 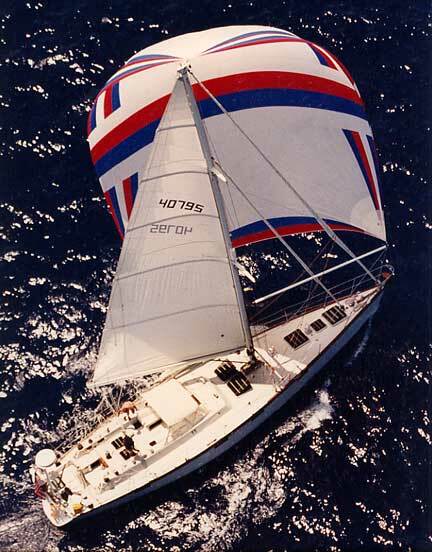 Kela, shown above, is one of the many Sundeer 64s that have circumnavigated. As with all of our previous designs, the Sundeer Series all incorporated fore-and-aft watertight bulkheads, aft engine rooms, owner’s suites forward, and very slippery, easily-driven hull shapes. The 64 above has now done two trips around the world with different owners. 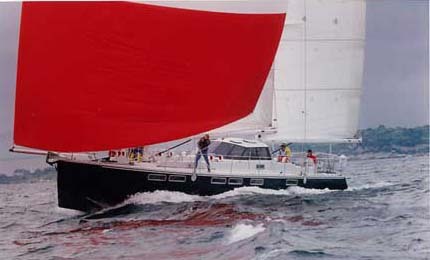 The first of these boats, Artemis (shown above), broke Moonshadow‘s ARC transatlantic race record – and then went on to complete the first of several circumnavigations. All but two of these boats were built as ketches. 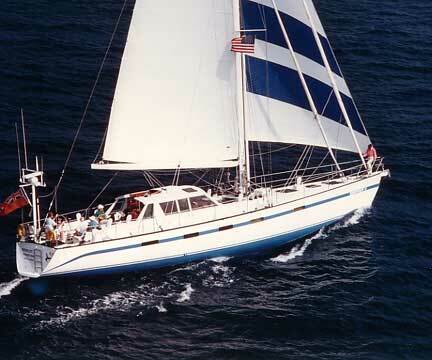 The ketch rigs feature aft-swept spreaders and no standing backstays. This configuration allowed us to design large roached mainsails, which are super-efficient and easier to handle than conventional triangular sails. The cutters have a larger main and forward triangle, with less windage than the ketches. Silver (above), now called Raven, is currently in the South Pacific. These boats are a little quicker under sail, especially directly up- and downwind. We’re often asked which we prefer. Both have their advantages. 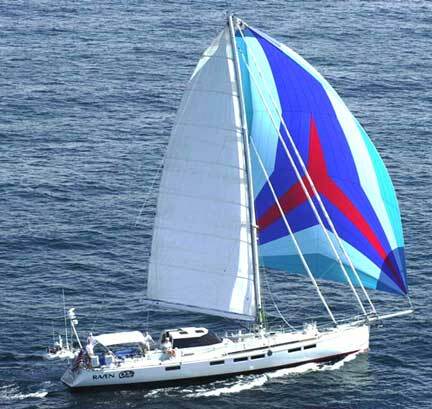 The ketch offers more versatility in heavy weather with the ability to shorten down to reefed mizzen and a small headsail set on the inner forestay. You can also make do with just a scrap of mainsail in really awful conditions. 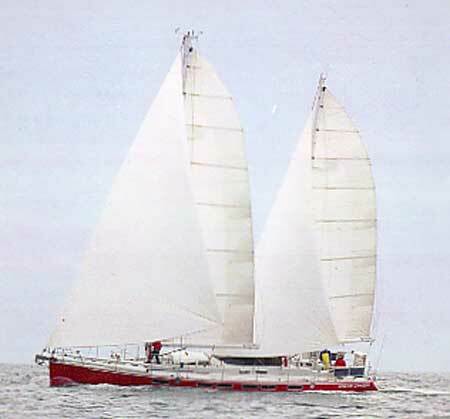 The Sundeer 64 ketch Theta Volantis (above), also a circumnavigator, dealt with a severe winter storm in the North Atlantic during her initial delivery to Europe. You can read about this blow in our book Surviving the Storm. The crossing of the North Atlantic by Artemis can also be viewed on the video “Winter Crossing”, on our YouTube channel. 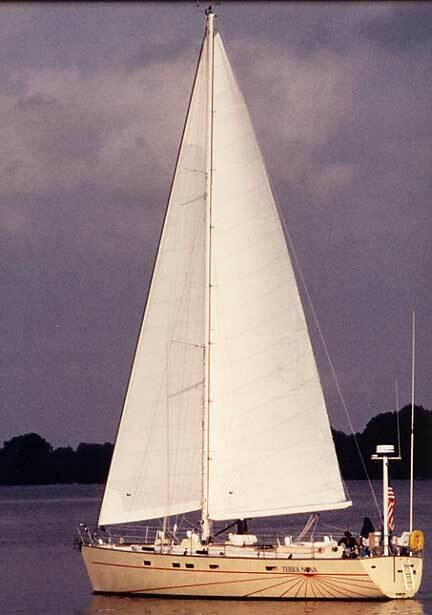 With the cutter, as the breeze really picks up, you eventually drop the main and go with a staysail or storm jib set on an inner stay. Both rigs work offshore. But they require a different approach. There’s also a major aesthetic difference between the appearance of the two sail plans. While we’re on the subject of heavy weather, the anchoring system on these boats might be of interest. 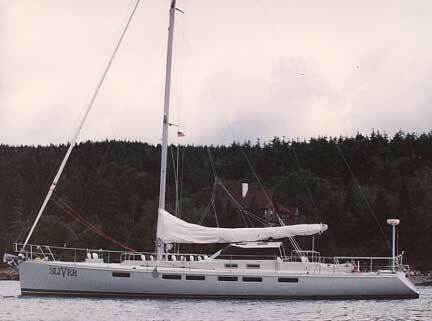 One of the Sundeer 64s rode out hurricane Ivan at anchor, on the island of Grenada. 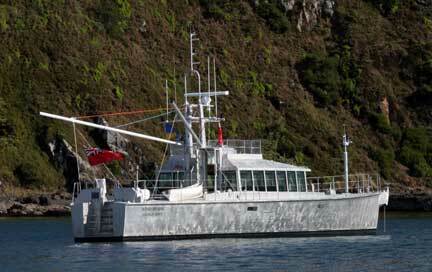 She came through unscathed – one of the only boats on Grenada to do so. We like big anchors. The standard hook on this design is an 80Kg Bruce (176 pound). 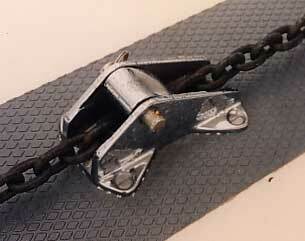 We specify schedule seven, high strength chain. In this case 3/8″ (9.6mm) was used. 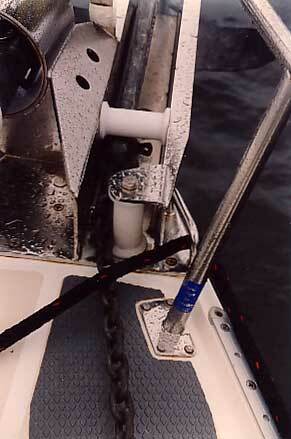 That chain stopper, chain, and anchor withstood winds up to 150 mph and 6- to 8-foot seas. Here is a view looking up at the anchoring sprit. Notice the compression strut and heavy stainless construction. This is the inboard end of the anchoring sprit. We’ve used this type of engineering for years. Now, after Ivan, we know we’ve got it right! 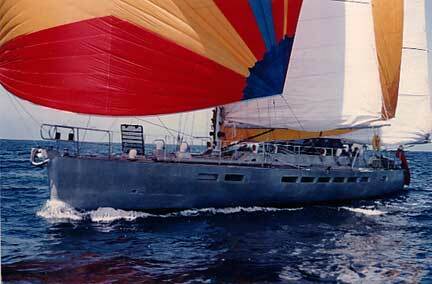 The Sundeer 56 and 60s were a natural outgrowth of the 65-footers. These boats were designed to be the most efficient two-person cruising boats we could conceive – efficient in terms of the cost of ownership and effort required of the crew to move them across oceans (many of these designs have also sailed around the world). Some of these boats were done with hard dodgers. 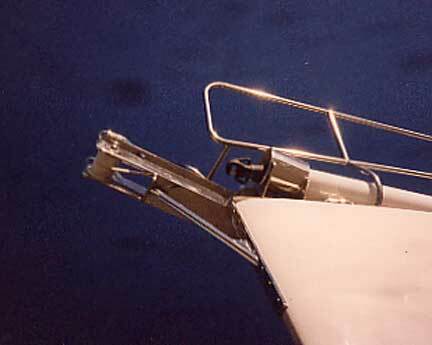 All of the control and reefing lines are easily accessible from inside the cockpit. 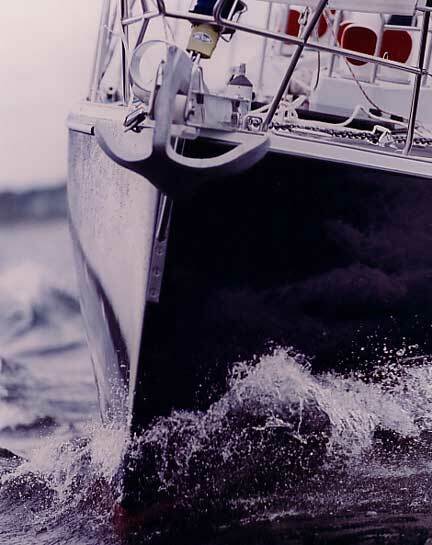 The Sundeer 56 and 60s share the same approach to safety at sea, which has served us so well all these years: watertight bulkheads, extra-heavy hull scantlings, beefy ground tackle, and a balanced hull shape that is easy on its crew in normal and adverse weather. These boats also incorporate the large aft engine rooms and the isolated forepeaks of their predecessors. With the Sundeer 67, and then the 64, 60, and 56, we found that the new hydrostatic relationships were working really well. These designs are what we refer to as apparent wind machines. They are so slippery under sail that they initially build driving force with apparent wind faster than their drag increases. This makes for some really quick passages in moderate airs – and the boats are great fun to sail. The Sundeer Series offered us a taste of what was possible if we were careful with weight, while refining the hull, fins, and rig one step further. What followed was our next test bed, Beowulf. 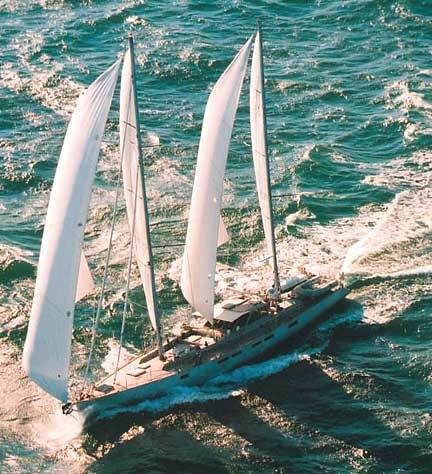 This 78-foot ketch is as close to the perfect cruising machine under sail as we’ve come. She’s the easiest of all our personal boats to handle. 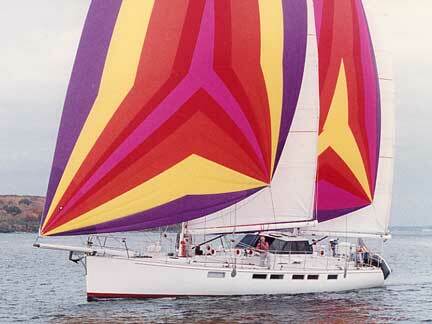 More than 40,000 miles have passed under her keel with just the two of us aboard. Beowulf consistently averaged 300 miles per day in the trades, is quick enough upwind to hold her own against any cruising boat, and is an excellent motor boat (she regularly cruises at 10 to 11 knots under power). 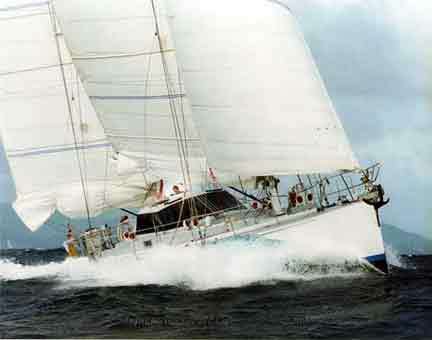 During the period in which we were privileged to own her, she twice lowered the elapsed time record in the Caribbean 1500 (while winning overall on handicap), broke Mari Cha III‘s record in the Guadeloupe-to-Antigua race, and made an uneventful passage from the Marquesas Islands back to California in the record-setting time of 12 days, 3 hours (taking 6 days off the previous record for this 2800-mile passage against the trades). All of this taking place with just two of us aboard – except for the Guadeloupe-to-Antigua race, when we had our son-in-law Todd with us. …we could back off a bit, drop down to these two roller-furling code 0 jibs. She’s doing a steady 16 knots in the photo above, in 22 knots of breeze. As previously mentioned, the rig, hull, and foils were refined from the database we’d acquired with the Sundeer Series. Beowulf was as well-behaved in a storm as you could ask for. 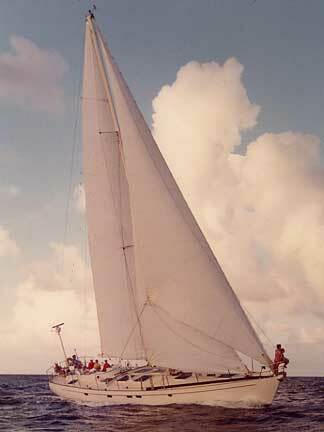 As the breeze picked up, we’d put away the headsail and go main and mizzen. Then, when it really started to blow, we’d drop the mizzen and sail just on the mainsail, which was only required once – during a 55-knot winter blow in the deep South Pacific. We rarely reefed. There is one facet of cruising with Beowulf‘s performance that we did not expect. This was the enormous benefit in terms of weather routing which her speed conferred on us. You would not think that an increase in speed from Sundeer‘s 200/230 miles a day to Beowulf‘s 280/300 miles a day would make that much difference. But it does. That extra 50 to 80 miles a day was enough of a bonus to significantly enhance our weather routing “skills”. It became a lot easier to pick where we wanted to be to meet (or avoid) certain weather situations. As a result, Beowulf was a “lucky” boat, generally sailing in fast, comfortable wind conditions. In fact, she only had one “slow” passage in all her 40,000 miles with us. This was a midwinter passage from Panama to Curacao – an unavoidable 900-mile beat into 25 to 40 knots of wind – which she accomplished in four hard days. If this sounds intriguing, and you’d like to get a better feel for what Beowulf is like offshore, watch some of her videos on YouTube. Which brings us to the present. The FPB Series represents for us the “Next Step” on the cruising evolutionary ladder. This design incorporates the extremely efficient approach to passagemaking we’ve developed over the past 35-plus years. The difference is that this technology has been put to work on an “UnSailboat.” The propulsion systems reflect this in terms of their power requirements, and the FPB’s cruising speed – 11.3 knots (with a 5000 plus-mile range). Slippery? Yes. But even more important, the FPB series are significantly more comfortable offshore and safer in heavy weather than conventional trawler-type motor yachts. Our frame of reference in this regard is different than the rest of the industry. We’re totally spoiled by the offshore abilities of the designs like Sundeer and Beowulf on which we’ve put so many miles. So, we are happy to report the FPB design has turned out to be even more comfortable at sea than any of our sailing designs – a fact attested to by the 25,000 miles of cruising Wind Horse has done in her first 17.5 months of use since leaving New Zealand. Remember those earlier comments about weather and boat speed? Well, this design has the ability to place itself in even more efficient and comfortable weather patterns than was the case with Beowulf. This entry was posted on Thursday, October 20th, 2011 at 3:34 pm and is filed under Dashew Offshore, Dashew Offshore History. Both comments and pings are currently closed. Is it possible to get a sundeer 20 or 64 design to build ? I am planing to buid my boat for extreme latitudes and work as charter, expeditions and photography courses… and Sundeer plans just make me so happy to dream ! Sorry Guillermo, you’ll have to look in the used boat market for a Sundeer–they are no longer in production.